April 7, 2000 Here are the ladies holding the Mt. Prospect plaque with the jail number on it. 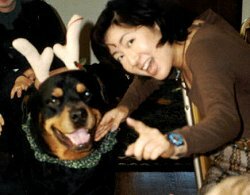 Mr. Shimura looks rather handsome, don't you think? He had the opportunity to try on the Fire Gear, which weighs from 10 - 15lbs. There is an air tank that is worn with this outfit, but 35 more pounds would have tipped the poor fellow over!! He said that the boots felt very heavy. Not surprising, when the tips are made of metal. 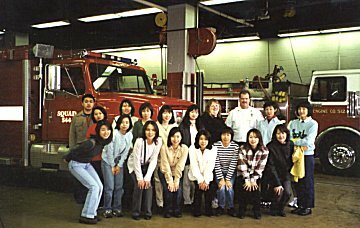 Here is our 2000 class picture, with a few friends joining us, including our tour guide, Lt. Richard Doubek. Not only was the tour a great learning experience for my class, it was also a great time. We would like to take this opportunity to thank Officer Bill Roscop of the Mt. Prospect Police Department, and Lt. Richard Doubek of the Mt. Prospect Fire Department for taking the time to help us understand the valuable services you provide our communities. This has helped our students feel more comfortable in case there is ever an emergency that arises while they are here in the United States. Here is Misuzu and friends enjoying a beautiful day at the pumpkin farm. 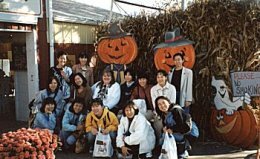 A group picture in front of Goebbert's Pumpkin Farm in fall of 1998. 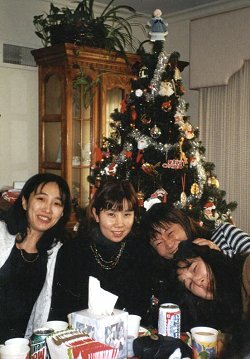 Christmas 1998 a picture in front of Debby's Tree. 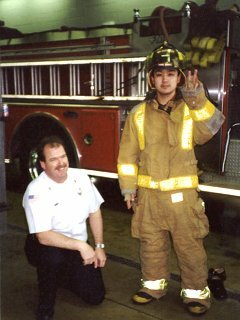 Misuzu and Officer Bill Roscop on a tour in 1999. Here is our class picture, with a few friends joining us, including our tour guide, Officer Jim Miller. We had a wonderful time for all of our visits to the Mt. 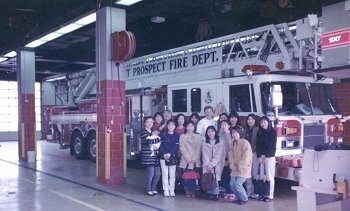 Prospect Police/Fire Department.